Path to Change: Each change comes with an explanation as to why the change is important, as well as a "Path to Change," which provides tips and recommenda¬tions to help you successfully implement the change. 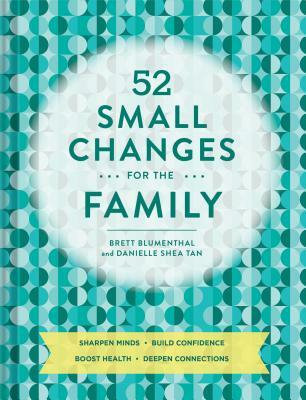 Backed by research from leading experts and full of helpful charts and worksheets, 52 Small Changes for the Family provides a road map to a better life for the whole family. Readers who love self-improvement books, such as Gretchen Rubin's Happier at Home and The Happiness Project will love this book for its practical and actionable advice. Brett Blumenthal is the internationally bestselling author of 52 Small Changes for the Mind, A Whole New You, 52 Small Changes: One Year to a Happier, Healthier You, and Get Real and STOP Dieting! She received her MBA, with a focus on Spa and Wellness, and Bachelor of Architecture from Cornell University. She is certified by WELCOA (Wellness Council of America) and AFAA (Athletics and Fitness Association of America). She lives in North Carolina with her family.